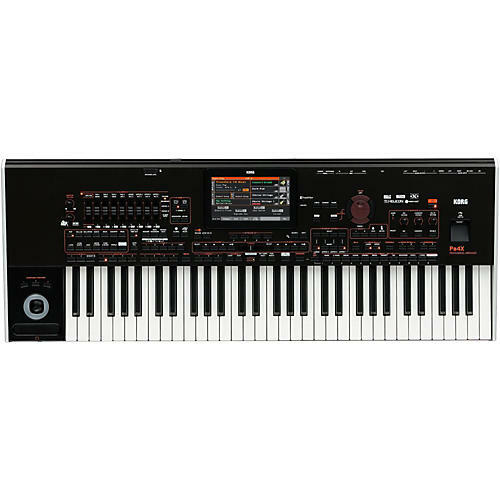 Korg’s Professional Arrangers are among some of the most popular keyboards available, and now the Korg Pa4X continues on the series with improved sound quality and expressiveness, more extensive arranger functionality, and an upgraded interface including a larger color touch screen for fast access in any live situation. The Pa4x is loaded with high-capcity PCM sounds, that’s ten times the amount found in the Pa3X, including a stereo grand piano with full-key sampling plus string and damper resonance akin to the Kronos2. There’s also a 7” TFT color display, almost 1.5” bigger than the Pa3X, with improved sensitivity and tilt ability. Each Style is a fully realized musical environment dedicated to reproducing a specific musical genre, and the Pa4X is packed with over 500* of them. Play along with these styles which cover song styles from around the world, from the past right up to today. These highly-versatile Styles have been created by KORG’s international sound team to provide an extremely musical experience. New Styles have been added, and many cherished Styles have been brought up to date with new sounds, enhanced effects, and re-balanced mixing. In addition to drums, percussion, and bass, each Style can provide up to five additional instrument parts that follow your chord changes and voicings, as well as the tempo. Guitar Mode 2 makes the Style’s guitar tracks more authentic than ever before possible. In addition, each Style can be enhanced by using the four Pads. Each Pad can add a one-time or repeating riff, a percussion part, an accent sound, or even a sound effect. You can even program your own Pad riffs and phrases. And of course, each Style features an assortment of Intros, Variations, Breaks, Fill-Ins, Endings—even a count-in. You may also create your own brand-new Styles, or customize the existing ones. The convenient Chord Sequencer function can quickly record and loop your chord progressions on the fly in Style Play mode; this can be useful not only for practice, but for freeing up your left hand while performing live. These Chord Sequences can now be also saved as Style and SongBook entries for easy recall. KORG’s XDS Dual Player & Recorder features a crossfade slider for providing non-stop entertainment; load one as the other plays, then crossfade between them—or create a playlist for automatic playback. Two different MP3 or MIDI files can be played simultaneously. MIDI files and even MP3 files can be transposed, sped up or slowed down. There is also a Marker Function to allow direct jumps to a given position in the song, or to create loops between song sections. The “MP3+G” (also known as MP3+Graphics) format and other popular lyric formats are supported. This feature allows MP3 files to play with lyrics and graphics that can be displayed on the built-in display or on an external monitor—or both. The Vocal Remover quickly eliminates the vocal track from MP3 songs—ideal for live karaoke! The 16-track recorder allows sophisticated levels of sequencing and editing, and also provides quick and easy song creation using the Backing Sequence and Style functions. The Pa4X can record your entire performance; you can play back a song, play the keyboard, sing along, and everything will be recorded and saved as an MP3 file. You can then play that MP3 file again to add a further keyboard track or voice using the well known “sound on sound” technique. Using the note data saved in a MIDI file, the Pa4X can display traditional musical notation with notes and/or chords, together with lyrics and chord abbreviations. This sophisticated Score Viewer can be seen on the internal TouchView™ screen, or displayed on an external video monitor. Chord names can also be seen in English or Italian.